If this doesn't prove that design colors each and every part of your life, I really can't imagine stronger evidence. 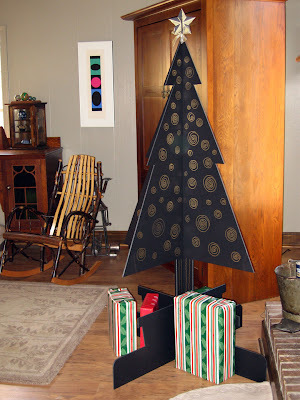 I made this tree a few years ago to cure the broken ornament problem. I have a cat heavy household and Christmas trees are just a compulsory (if you are a cat) invitation- they just can't help themselves. So, to keep from making them into purses, I made a cat-proof tree. It's lasted for three years and it's getting a little ragged- but so far no cat purses. Hope you all have a happy holiday and a happy healthy new year. Loving that tree. VERY Scandinavian! I agree, I think it has potential. Call IKEA!